On Thursday, 27 February 2014, Ian Dunt, captured this heading on the politics.co.uk: “Facing facts? Salmond mulls the future after a ‘no’ vote”. This relates to the 18th September 2014 crucial referendum on Scottish’s independence from Britain, for which a day before that report, Alex Salmon- the Scottish first minister, is said to have openly contemplated his future in the event of a ‘no’ vote in the Scottish referendum, which suggests the first sign that his faith in his ability to win the vote may be lagging. Current polls put the ‘yes’ camp 12-points behind, yet the first minister states he remained confident of winning- insisting that he would continue to fight for another referendum even if he loses this one, too. In response to such accusations; President John Mahama, in the words of GNA, told his audience in the Central Region that: “When I was presenting the State of the Nation Address to Parliament, I said we will implement ‘progressive free education’ and my checks at the Copyright offices indicate that no one has the intellectual property of free education.” But radioxyzonline quotes Political Strategist- Dr Kobby Mensah, as saying that the main opposition NPP owns the free SHS because it was idea on which the 2012 elections was fought and that the NDC’s intention to implement the policy strengthens the NPP’s earlier justification for it. He accordingly advises the main opposition NPP to pursue the same message in the 2016 elections and leave the electorate to judge rather than abandoning the whole idea. But working with others in good faith had always been the pitfalls of the Ghanaian politician. This is why the heart of the politics which in the words of Heywood, is often portrayed as a process of conflict-resolution, in which rival views or competing interests are reconciled with one another had been missing in all Ghana’s political attempts even today. However, politics, it is said, in this broad sense is better thought of as a search for conflict-resolution than as its achievement, since not all conflicts are- or can be – resolved. Thus so long as we remain as human beings, we shall certainly, have our differences on the basis of history, our upbringing and various beliefs. Respect, must therefore, always be the reminder. Ghana’s political landscape is littered with unrefined vocabularies and unsubstantiated allegations all in attempt to outwit our political opponents. Achieving post-electoral reconciliation, trust, goodwill, knowledge-sharing and recognition had been as distant and difficult as the Spanish War of secession. Which is why in their efforts to gain independence and probably, not to muddy existing cordiality thereafter, similar treatment is said to have been dished out by Salmond, to Olympic medalist Chris Hoy and Scottish comedian Susan Calman. The concerns here are the excesses that pop-up on the internet. “I would make the appeal that everyone participating in this debate should be conscious that we want to have a debate which is worthy of the importance of the decisions which are being made.” “All of us know it’s a function almost of the internet when people are participating in perhaps the early hours of the morning, that they don’t choose their language as they would often in a public forum … or when they were in conversation.” Nana Akufo-Addo is currently not a presidential candidate and little could be predicted whether or not the NPP national delegates might return him back to mainstream politics. According to Dunt, Salmond- the first minister had previously been criticised for failing to challenge the overly-aggressive behaviour by online Scottish nationalists, who are sometimes referred to as ‘Cyber Nats’. But the John Mahama NDC-led free SHS policy might uncompromisingly, also encounter this: “Lee Ocran mocks School Heads; if Gh¢1.80 is insufficient, try Free SHS’ test. On 21 November 2012, the then Education Minister Lee Ocran, was quoted to have mocked head teachers who said the feeding fee being charged is insufficient and could affect the quality of food given to students. “If Gh¢1.80 is insufficient and could lead to poor quality of food to students, then what will the quality be like if it is free as the NPP is proposing under its free SHS policy?” Myjoyonline reported that the Minister gave a directive for the school heads to desist from charging Gh¢2.50 as feeding fee and revert to the Gh¢1.80. What, then, do you think is left with Nana Akufo-Addo where from bottom-up, delegates overhaul its executives and presidential hopeful- John Alan Kwadwo Kyeremateng, asserts with optimism that the accession of his perceived disciple to his political kingdom- Mr. Paul Afoko, on the NPP’s chairmanship throne, “signals the coming change”? In his interview with Oman FM Sasu Manu in Tamale, dated 12 April 2014, Alan spoke about a wide range of issues including a simmering propaganda within the NPP notwithstanding the yearnings for his presidency everywhere he did go. He also made mention of the political concession in the night of 23 December 2007, at Legon Hall, to Nana Akufo-Addo, who he describes a senior brother. 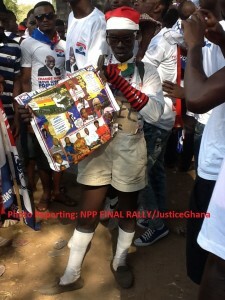 On that day, Nana Akufo-Addo was elected as the NPP’s 2008 presidential candidate at the NPP congress with 47.96% (1,096 votes) of valid votes. This was below the legally mandated 50% +1 vote, to lead the party. We mention in passing that with 738 valid votes count under his sleeves- representing some 30+ %, Alan, could have hinted a shot but bowed to Nana Akufo-Addo.